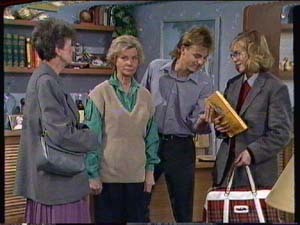 Mrs Mangel is telling Helen, Scott and Jane what happened to Graham and moaning that Clive wouldn't let her stay with Vicky. 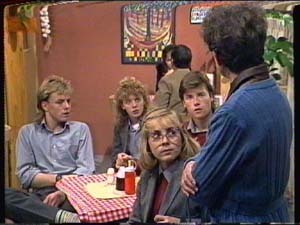 Scott compliments Jane on her poster at the Coffee Shop, but Mrs Mangel says that Jane's artistic talent is nothing compared with her mother's(!) She goes on to say that Jane isn't very pretty and therefore will never get a decent man. Scott says that he doesn't mind a girl with brains, but Mrs Mangel says Charlene is hardly genius material(!) Everyone seethes but says nothing. The police are interviewing Vicky and tell her that she's been very brave. Kate goes back to the hospital - she's obviously very worried about Graham. When Kate has gone, Clive sits with Vicky and she says she's scared that the police won't catch Alex Carter. Clive reassures her. 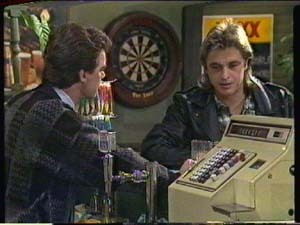 Shane tells Paul that he thinks Alex stole from the till. Paul doesn't believe it though, he thinks it was the biker chick, and after all, Alex did save Shane's life. Just then the police come in looking for Alex saying they want to talk to him about attempted robbery and assault. They say they'd like to search Alex's room. Kate comes home from the hospital to find Clive alone in the living room still playing with his puppet(!) Apparently the surgeons are happy about Graham but there are no guarantees yet. Kate wishes that they'd never moved from the country - she never really wanted to leave the peace and quiet anyway. But the city had more opportunities for them. Now with the state Graham's in, she thinks it was a mistake. 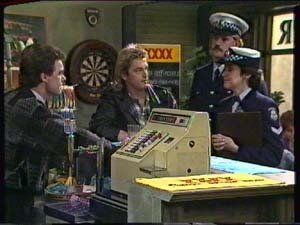 Paul is apologising to the biker chick and offers her a raise to make up for things. Madge is going to the Coffee Shop so tells Charlene that Susan will have to manage on her own for a while. Charlene thanks Madge for looking after Susan. Jane comes in looking particularly plain in her school uniform (bless). Charlene says she knows Jane likes Mike, but it's no good - Jane's not his type. Jane thinks maybe she's too smart and it might be better if she did badly in the maths test today. Clive come in with good news - Graham is out of danger. Kate is delighted. Kate says that she might have to give up her job with Paul - she wants to spend as much time at the hospital with Graham as she can. Paul says that he'll sort everything out. Suddenly Clive says he'll fill in for Graham - since it's an emergency. He admits he's terrified of going back to medicine, but he'll give it a try. Madge is complaining to Daphne about Max and Tom swapping houses. Daphne says she'll have a quiet word with Shane and see if she can get him to come home. Paul offers Madge Kate's job and she's delighted. She's about to dash home to change, but then remembers about Susan and Sam - she can't leave them alone. Madge asks Paul if she can hold the job open, but Paul says he really does need someone permanent. Shane and the biker chick are having a cup of tea. She tells him off for being soft! But she says he's been a perfect gentleman and that's great. They have a little pash but at that moment Daphne walks in. She is surprised and says she'll come back at a better time. Shane chases after Daphne and says he didn't expect her to come barging in. 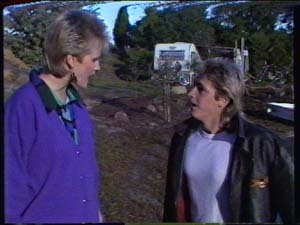 She says that everything's very cosy in the caravan and Shane accuses her of being jealous. But Daphne says she's married to Des and she doesn't think about Shane anymore. Shane says he's learned his lesson and he's not going from girl to girl anymore. Daphne says good-humouredly that she'll believe it when she sees it! Mike has come top in the maths test with 92%. Apparently he beat Jane and everyone is surprised. Obviously she has purposely done badly but she's very pleased for Mike. Mike says they should make a toast to Jane for being a good loser. Jane looks even more pleased! Shane comes in to find the biker chick pretty fed up with him. She wants to know what's going on with Daphne. Shane says he cares about her, but Daphne is married now. He admits he's been avoiding Des and Daphne since they got back from their honeymoon. He asks the biker chick if he can come with her when she moves on. She agrees as long as it's a "no-strings" arrangement. Mrs Mangel comes in at that moment and orders Jane home. Apparently the maths teacher has rung about the test. Mrs Mangel doesn't think that Jane has done her best in the test. She says making posters for the school dance is a waste of time - noone will ask Jane to go to the dance anyway(!) She says it's better for Jane to concentrate on her schoolwork. Jane runs out of the Coffee Shop in tears. Daphne runs after her. 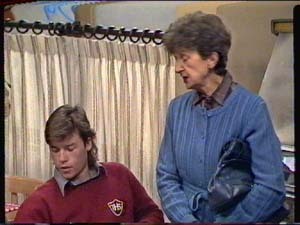 Scott takes Mrs Mangel on and says that last night at his place, she said that Jane shouldn't show herself to be too clever or she'd never get a boyfriend - she's giving out mixed messages. Suddenly Charlene realises what's happened - Jane has thrown the test on purpose. Charlene shouts at Mrs Mangel saying that she's always telling Jane that she's ugly and it's not on. Charlene tells Mike that Jane really wanted him to take her to the dance. Mike is appalled to hear about Jane throwing the test.